I’m talking to you, for you, about you…because of you. 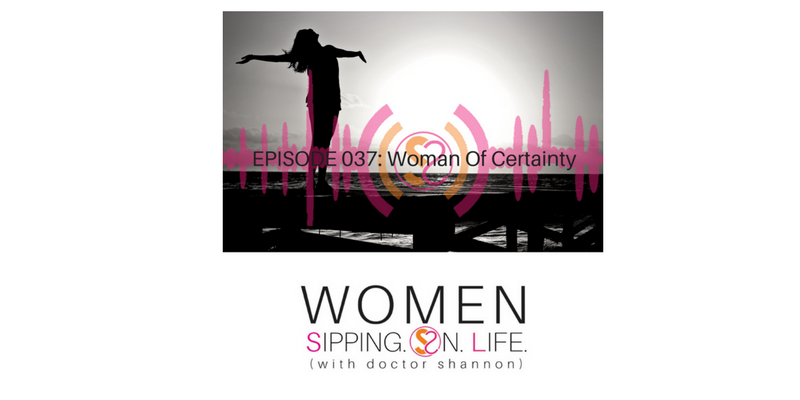 Right now, you may be saying to yourself, “I don’t feel so certain.” That’s okay, because I promise that by the end of this episode, you’ll feel more certain. Can we get that agreement? Can we get the anticipation and expectation up? Get your hopes up to have increased certainty. The connection of certainty is like plugging in my microphone. Without it, everything else falls short and things don’t work. You may be standing up, showing up, and speaking up…but not being heard. Your metaphorical microphone isn’t plugged in if you aren’t certain. 1. Get certain about what you DO KNOW by connecting with YOU…your heart and soul. You must connect with your heart and soul. No one can do it for you. You can know WHAT to do, but if you’re not first connected to your heart and soul…YOU…and the KNOWING within you, then you’ll lack the CERTAINTY necessary to do it, be heard, and to live the life you desire. CERTAIN. This word takes me back to when I wrote my first book, Dr. Shannon Knows…The 12 Steps of WELLTHY People: How to Make Healthy Your Habit. So…someone that’s “certain and sure” actually brings healing. If you’re looking for healing in your life, or healing in the area of your certainty, today’s the day to be TRUSTWORTHY. Are you worthy of YOUR trust? What are you certain and sure about? Yes, a trustworthy – certain and sure -messenger brings healing. You are the greatest healer from within. YOU are a healer within. Yes, I’m a Healing Life Coach. A healer. That didn’t happen with me trying to HEAL other people. It happened with me receiving the healing that was already available to me – on the inside of me. And that’s what I’m talking about today. If you desire to be CERTAIN, you must first make the connection between your heart and soul. Then get what you desire and believe in alignment, mixed with the foundation of trust and truth…you’ll be unstoppable. 2. Get Clear. Clarity is King and Queen. If you have clarity and certainty, you’ll be king of your domain, castle, and kingdom…YOUR QUEENDOM. The QUEENDOM that you’re creating is what you desire. It’s YOUR LIFE. God gave you a call, purpose, and mission for your life. No one else can fulfill that but YOU, my dear. You must get clear about this. Often we spend so much time thinking about what we don’t know. instead of what we do know. Tap into what you DO KNOW about YOU, your desires, and what you’re creating. Connect with who you are. Get clear about who you are. Get clear and committed to pursuing YOU, your heart, soul, and desires. Pursue HER to get to KNOW HER like never before. I remember the day I decided to pursue me, like it was yesterday. It was after I heard the voice of God in my heart, asking me if I loved myself. This is when my Journey of Certainty began. We spend so much time trying to get known by others, to get to know others, or to BE KNOWN. This is all ridiculous if YOU don’t know YOU. If you don’t receive you, how can you give yourself to anyone else? Am I making myself clear? This is KEY. This is the TRUTH. This is a trustworthy message. I am the trustworthy messenger bringing you a certain and sure message of healing. IF YOU RECEIVE IT. Get clear about who you are, what you desire and what you believe. Connect with your heart and soul. 3. Get confident. Stand with confidence. Know that you KNOW that you KNOW. Whatever THAT is for you. What do you know? Then tap into it. Find your confidence in a GRATEFUL HEART. Focus on the ONE THING YOU DO KNOW. The one thing you’re grateful for. 4. Get COMFORTABLE with being UNCOMFORTABLE. It’s the compelling CHEMISTRY you can have with your life. Claim your life as yours. Approach it, and each day as an adventure. Today’s your day. Learn. Grow. Expand. Expand your territory. Expand your horizons. This is what CERTAINTY is all about. People will follow those who are certain. Align with truth. Are you being a trustworthy messenger that is sure and certain of who you are, why you’re here, and what you’re doing? Get after it. Begin to act in, and with, that CERTAINTY…and watch what happens in your life. Would you be willing today to claim your CERTAINTY? Even if it’s a small stone of certainty that you can stand on. It will grow. It will grow because YOU GROW. Please grab your SACRED S.O.L. D.A.T.E. JOURNAL. 1. Write down exactly what you know, and are sure and certain of today. 2. Make a commitment today to get to know that certainty even more. To stand in it. To grow in it. To walk and live in it. Watch what happens in your life. I’m so grateful that you joined me today. Thanks for allowing me to speak into your life with certainty, as a trustworthy messenger, so you can heal your life and life’s work. This is my journey, life’s call, and life’s work. I’ll look forward to seeing you again tomorrow. Please share and comment at WomenSippingOnLife.com. Please subscribe at iTunes or Stitcher, if you haven’t already done so.